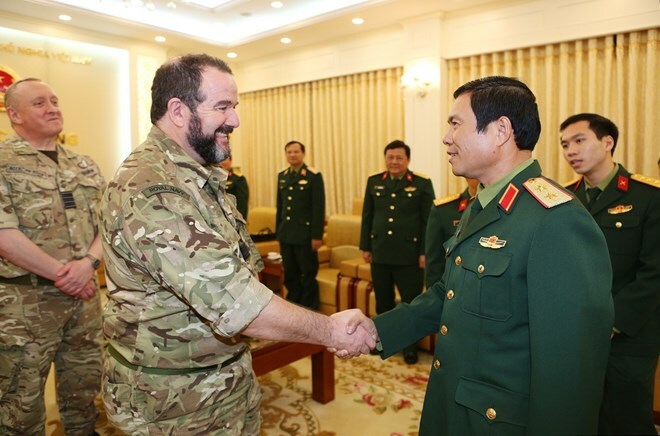 Hanoi (VNA) – Deputy Chief of the General Staff of the Vietnam People’s Army Lt. Gen. Nguyen Tan Cuong received head of Medical Operational Capability at the UK’s Ministry of Defence Surgeon Commodore Stuart Millar in Hanoi on March 25. The host, who is also a member of the Communist Party of Vietnam Central Committee and the Central Military Commission, expressed his delight at the strides in bilateral cooperation in defence and the United Nations’ peacekeeping activities. He thanked the UK for its support of Vietnam’s peacekeeping mission preparations via English language training programmes, experience sharing, and assistance with the field hospital transfer at the UN peacekeeping mission in South Sudan. Thanks to the assistance of the UK and international partners, Vietnam successfully deployed its first level-2 field hospital to replace the British one in October 2018. This was an important and new milestone in Vietnam’s participation in peacekeeping activities, Cuong noted. He also described it as a demonstration of the two countries’ cooperation in the UN’s peacekeeping operations. The officer asked both sides to increase knowledge and experience sharing in military medicine. He expressed his hope that the UK will continue helping Vietnam prepare its second level-2 field hospital so it can be ready to replace the first. The two sides should also enhance communications and coordination between military medicine units to boost cooperation possibility, he added.